ONE MORE DAY to sign up for the giveaway!!! Go here for more information! I want to think those of you who have signed up the giveaway….for sharing stories of your pets with me. We sat and read them last night and laughed and laughed at the characters who have stolen your hearts….I wish I could do a free portrait for all of you…but don’t forget to take advantage of the discount …. THE COUNTERTOPS. I spent a good few years, on my regular LOWES and HOME DEPOT runs, wandering over to the Kitchen countertop section, running my fingers over the samples…dreaming of my Beautiful Marble Countertops..then for a while I had a fantasy of having Silestone…even a brief interlude with Granite. But never, EVER with Formica. Formica is what I had…and what I hoped to get rid of. One day while I was picking the brain of the patient Kitchen Designer…now on a first name basis, I glanced sideways and saw a finished Marble countertop…probably waiting for its lucky rich owner to pick it up. “Just for kicks…. how much would THAT marble be?” I asked. “NO WAY!! !” I said. I walked over and looked at it from all sides, and honestly could not see that it was Formica. It was wild! Then I touched it, and it was not cold like marble. That was the ONLY giveaway!!! “Tell me more about this Formica Marble” I said….. These beautiful countertops are really just digital “prints” of the real thing, technology at its finest….that is why they look so real. In 2012, FORMICA introduced the Ideal Edge, which eliminates the telltale brown seam line of Formica and can go around corners.That was the GOOD NEWS. The Not SO GOOD NEWS is that I ALSO FOUND OUT that there are ONLY a few Fabricators in the Whole country, I think they are in OHIO, that can do this Ideal Edge …..so in my opinion they spoke a little too soon because they put something out there that they really cannot provide wide scale. The countertops were ordered and due IN any day. 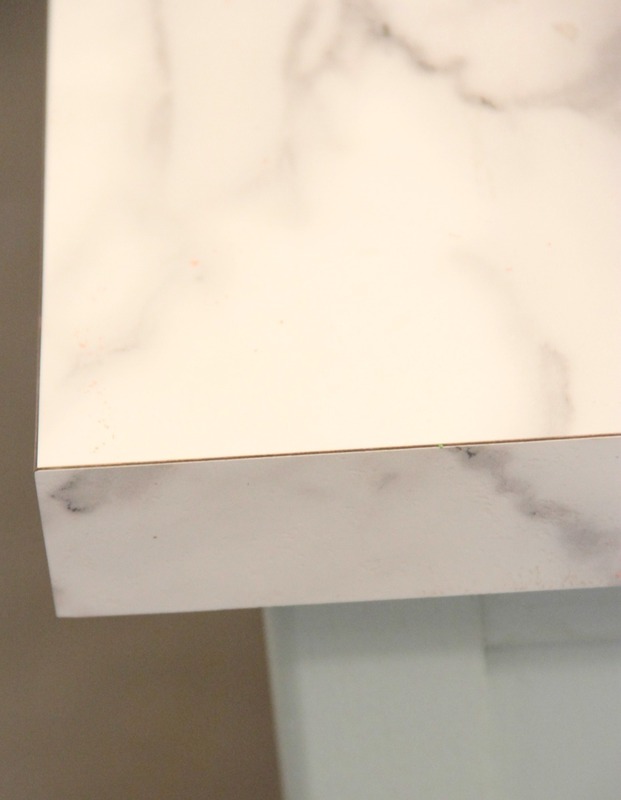 Then, I got an email while I was at the Design Bloggers conference that began “I am so sorry…” and it turns out they can no longer DO the AEGEAN edge with the Calacatta Marble because it cracks in the bending process. I was so bummed, but went with my second choice, the AMORE and actually think it was a GREAT decision. I LOVE LOVE LOVE them!!!! But I have gotten over it. I LOVE them. and I actually think the straight edge is not totally horrible…in fact it is kind of sleek. The ISLAND now has the straight edge on all 4 sides but is being made over with the AMORE on all 4 sides. 1. Cost. My Formica Countertops cost me under $800. 2.And they are so beautiful. 3.And they are less maintenance. 4.And they are less fragile. 5.And in a kitchen that is 45 years old…I just did not think it was sensible to invest over $5000 on Countertops. I think that is a ridiculous amount of money when we want to take the kids to Europe and put braces on their teeth or maybe buy some nice boots. If the LOOK were dramatically different…maybe…but honestly…These countertops are beautiful!!! THEY ARE BEAUTIFUL! AND I THINK THE BEST KEPT SECRET AROUND! Great NEWS. Since I wrote this post, FORMICA has launched a nationwide training program aimed at educating and training fabricators in the BIG BOX stores like HOME DEPOT AND LOWES on the construction of the 180X countertops in all of the edge profiles. and to make things right…MY COUNTERTOPS are being re-DONE IN THE ORIGINAL AEGEAN edge profile I wanted…I am so excited and I cannot wait to show them to you!!! What a wise decision – love them! from an old house owner and kitchen re-doer! Thank you for all the info on your “farble” countertops. They are gorgeous. I’m in the planning stages of a kitchen remodel and love the look of marble and had pretty much decided that it is what I wanted. Well sister, you have opened up my mind to consider other possibilities, Formica? Who knew??? THANK YOU. Carolyn… this makes me so happy to hear. I could not wait to show people how wonderful they are and listen if I become a Real Housewife of Greenwood and am rolling in dough, sure maybe I will spring for the real deal…but for now, I have the look, for less!!!!! Good job on thinking outside the box. The countertops look lovely. So where did you end up purchasing the counters? From Home Depot? Lowes? Or directly from Hartson Kennedy? I love them and I think I could probably do the small amount of counters in our kitchen for under $500. 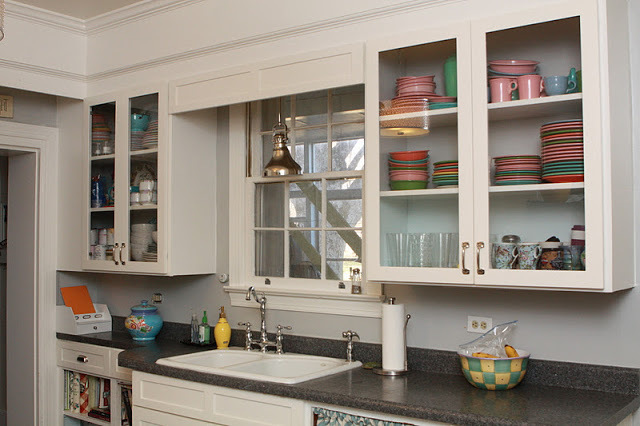 You also have me contemplating just adding new doors to our 1950s kitchen cabinets like you did. Such good, affordable ideas. I appreciate this post so much. I’ve often wondered how people afford to put granite and marble countertops in their homes if they have children. Not only do parents have to think about food, clothing, school fees, lessons, sports, and vacations, but there’s college right around the corner. My husband and I provided nice homes for our daughters while they were growing up, none of which had anything other than formica. We did, however, pay for all college costs! It’s all about priorities and preferences. One of my favorite blogs ever was Frugal Farmhouse Design. She has a fabulous house and was intentional in her use of formica in the kitchen for much the same reasons you have given. Your kitchen is amazing, and I’m always in awe of your artistic talent. Beautiful! This comment makes me so happy. You GET me and THAT also makes me so happy. I do love nice things and nice things are often times expensive, but in the end, you are so right…we have to look at the BIG picture…. Now I am off to go check out the Frugal Farmhouse!! Your kitchen sound great and I really like the Black Mineral too!!! You are amazing. And so is your kitchen. I love them. I do not love my granite, maybe when i redo I will get farble! Love the way it looks and it is gorgeous…. You have your priorities in the right place, truly! Thanks for this info. I wanted a marble slab in my bathroom (8 foot long) I have a real marble vessel sink I got at a steal and wanted the counter to match. I would have never thought of laminate if not for this post thank you, thank you, thank you! Saw this product in a ShopSmart Magazine a few months ago and was intrigued. Need to redo my kitchen and had a kitchen designer come in today and she had never heard of it. Wonder if it is available in Ontario Canada and if so, if it would be much more expensive here. Looks amazing. Have four girls to put through college so might be a great option. I would never have dared to dream that I could have new counters, then I read your post. My heart is pounding as I begin this first stage of planning. I must thank you for sharing your story. If I have questions I just go to Home Depot, is that right? Yes, Home Depot, or Lowes…either place will help you get your new counter tops!I suggest the “aegean” or the “amore” edge…they lend themslevs to the “look” of marble. good luck and send picks!!! I’m just wondering if the countertops stain easily since they are Formica and are mainly white? We have cream Formica and it stains pretty easily. I’m hoping with the updated technology, it won’t be a factor. I love this countertop!! One more question…how noticeable are the seams? 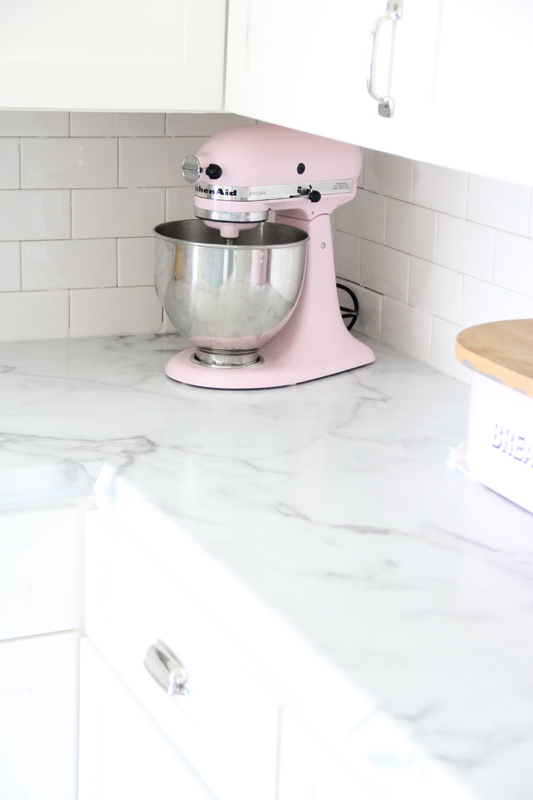 I really want to make this countertop work in my kitchen as well as it did in yours!! They do not bother me I don’t find them very noticeable . We only have one seam and it is in a very un-visible area ! Good luck! if you place the edging correctly the seam will be barely visable, but for those places where you can see it, you can get a tube of Seam Fill and it will make that line disaapear. It’s like $5 bucks a tube and I was able to find it easily online along with the matching charts for what colors you need for your particular formica. 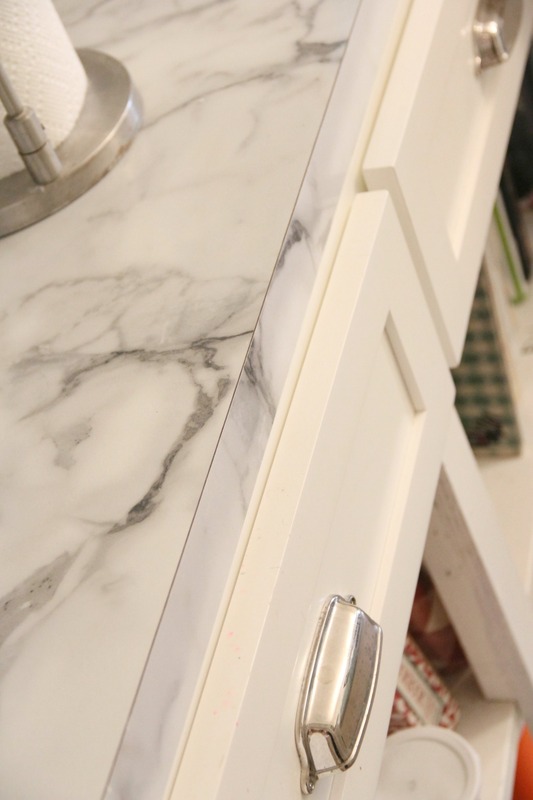 We used the carrara bianco to mimic carrara marble with an ogee edge and they look amazing! We tried going the Lowe’s route but they wouldn’t let us purchase the material without paying their installers to do it. Boo. We just had to do a little googling and we found a supplier. The whole thing was about $650. Rebecca, could you send me a picture of your Carrara Bianco countertops? I am desperate to see what they look like in a REAL kitchen! The calacatta and carrara are gorgeous, but I’m being very picky and need to decide soon! Sure, are you comfortable posting your e-mail address? If not I recently e-mailed a bunch of pics to the article author Lesli. She can see everyone’s e-mail address so she may be able to send you the pics without you having to post your address here. I would love to see pics of the Carrara Bianco as well! I’ve hardly been able to find any online. My e-mail is danielleATtheburgifamily.com. Thank you! Was web surfing re laminate countertops and found your web site. Enjoyed reading your experience in choosing laminate countertops. I’m in the planning stage of redoing a kitchen that is 17 years old and was not maintained, we purchased this house in 2013 as our down sized home. I plan on using formica for my counter tops too. Can’t justify the cost of solid surface countertop and granite was never on my wish list. Plan on using a full overlay, raised panel cabinet in a mocha stain with formica antique mascarello countertop. Appliances will be either the new ge slate or bisque color. Back splash will be in an creamy white subway tile. The floors r wood medium tone and they r staying. I love your kitchen! We are in the middle of a kitchen renovation and are going with the same countertops. One sales associate at Lowes told me that they can do the Aegean edge for me and another told me that they can’t. Did they come back and re-do yours? Couldn’t find any updated pics on your blog, but maybe I missed them. Brandy, sorry just now responding but did you ever get your Aegean edges? I’m in Ohio. Just wondering how to find the guys who do the ideal edge? I started by looking up formica suppliers online and eventually got to a guy who would sell me the material. I believe they actually make the ideal edge in ohio. Thank you for posting this. I’m looking for exactly the look you got in your kitchen for my master bath countertops. Our house is 22 years old and our neighborhood is coming back from a dip in value. Trying to get the most bang for my buck in remodeling both master bath and kitchen this year, giving myself the incentive of using saved $ for hardwood flooring in master bedroom. Hi, maybe a dumb question, but are these the formica 3460 calcutta marble? They look more light and soft comared to the stock photos online. I like yours better. Can you please let me know? Beautiful job! The secret is out. Formica marble is the way to go! Insightful article. Thanks. Well after reading this I might have figured out why I have stayed up for hours looking for the laminate counters with a more natural edge. I can order the laminate but then I am going to have a problem cause I cannot do good edges. My grandson who is a teen likes to stay busy and helps me with all these updates because I am disabled with kidney and heart failure. I have had quad bypass and an artificial valve which has left me short on money for updates and repairs on this house have lived here since I was 18 and am now 60 so you can imagine. Do you have problems keeping the sink corners clean? I want to get the same sink because of the flat rim, but have read that sinks with squared off corners are hard to keep clean. 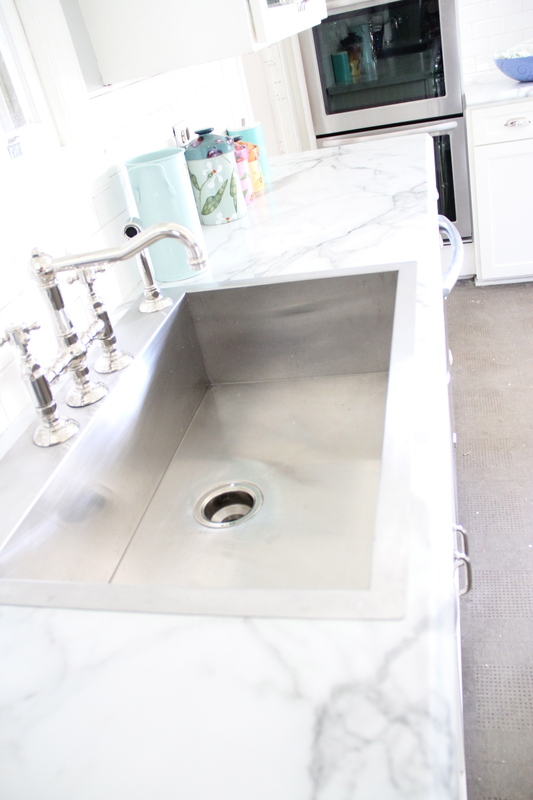 No, this sink gets no dirtier and is no harder to clean than any other sink…in fact it wipes down easy! The issue I am having w/ my current laminate countertops is the edging which is basically just a glued on strip – if you walk too close to it it catches on stuff and has begun peeling off – which is super annoying and seems to have been an issue with any laminate countertop I’ve ever had. 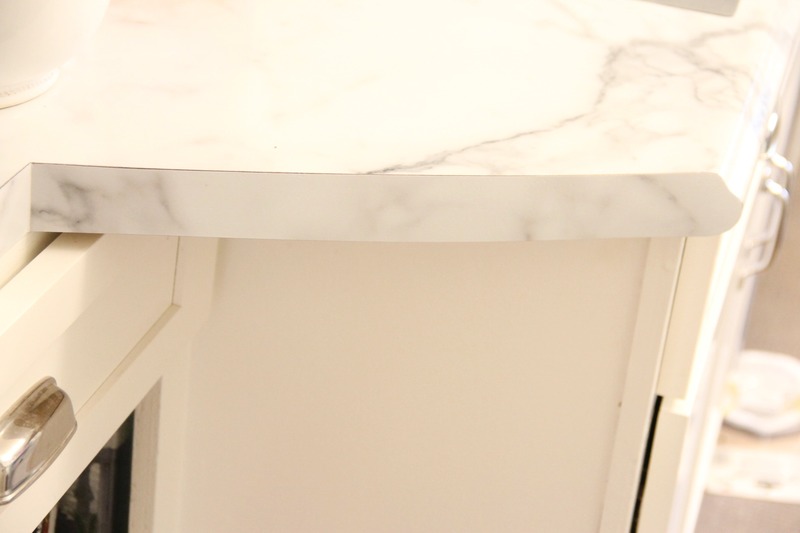 These countertops are great because the edge is continuous meaning to edge strip on most sides. If you have an island you can also get the ideal edge with goes around all four sides….! I would not give up …..for the price you cannot beat the look! good luck! Ideal edge is still a glue on strip but much more attractive. Also, for both your older style edge and the new edges you can buy a product called seam fill that comes in a tube and fills all the seams and hardens to the color of your countertops. It is very inexpensive and so for a few bucks and some time you can greatly improve how it looks and greatly reduce the chances for snagging etc. We found a chart online that tells you what colors to order to match your formica pattern and we are very happy with the result. You cannot see the seam unless you are looking for it. Is your new edge an IdealEdge? It looks like a rolled edge with flat strips on the ends and sides of the island. The above pics aren’t of my kitchen. Your assessment seems correct. We were able to miter the corners of the ideal edge and use it on all sides of our island. slightly confused..pictures? I would love to see them but none appear here….am I doing something wrong ? Thanks for stopping by! Hi, Leslie 🙂 We are in the middle of remodeling our kitchen. We chose a “farble” by Wilsonart with their version of the Aegean edge, and they have been cracked three times. We are now trying to decide what route to take. 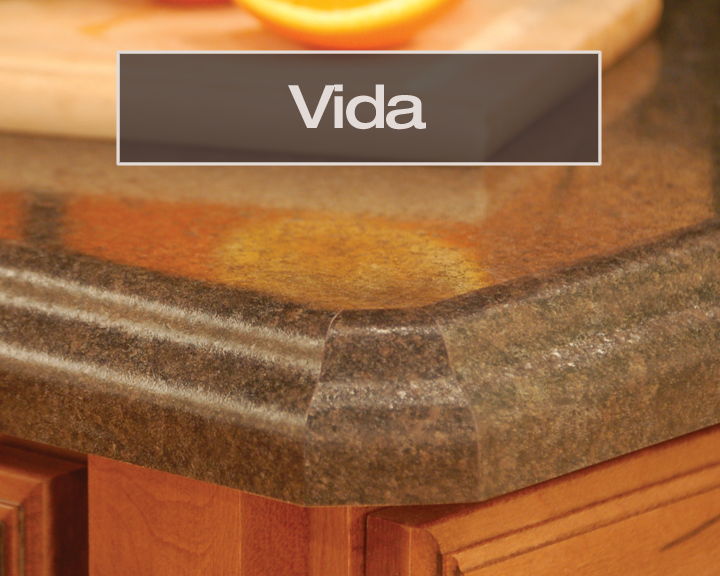 Were you able to get the Formica Aegean edge without any cracks? Thanks so much! Yes we did get the age an edge with no cracks. That is such a bummer. Are they offering to change products for you? Maybe try the Formica? I hope it works out…it really is so pretty. take care and let me know how it turns out. When we remodeled our kitchen roughly ten years ago, I never considered marble, granite, or any of the high end options. I don’t like them, plus I’m not one to follow the trends. It’s my house, I’m going to make it my house. 😉 We chose Corian for a small area of the kitchen (our coffee bar), but it was way too expensive to even consider for the entire room. What I had actually fallen in love with was a color from Earthstone (I still have the brochure), so I took my sample and hit the Formica aisle. I found a laminate so close in color that everyone who comes into the house has to check out the counter tops closely. When originally installed the seams were practically invisible (we had a fabulous installer) and we opted for the roundover edge, which adds to the illusion. I love my counter tops, and with a little polishing compound now and again it’s easy to keep them looking good as new. I’d never hesitate to choose laminate. Who installed the countertops for you? Home Depot? Or did you have to do the install? We had them installed by the guys that were putting in the kitchen..It took less than an hour. Calacatta Marble– is yours the “etched” selection? I don’t think I want the etching but that is the only selection I can find….THANK YOU ! I am getting ready to order the calacutta marble laminate as well. But I have looked at some real marble pieces and they are smooth and shiny.I have a sample with the etchings finish. Does the etchibgs look like real marble or ( if available) should I het a glossy finish? Believe it or not, it looks great!! But no, it is not shiny like real marble. If you are able to see a larger piece in person it might help in your decision making process. Good luck! Thank you for your quick responses. one more question. To use the top for an island they can only do the squared edge or the ogee. since it will have the edge all the way around. Which edge did u prefer? On our Kitchen island top, I did the Aegean (pencil edge) on two sides and straight edge on the other two. Good luck! awesome ! I bet it will look amazing! I’m looking at new countertops & love the marble look you have, but we have bisque appliances that we won’t be replacing. Your cabinets don’t look pure white…are they an off white? Just trying to see if it would work to mix bisque appliances with cabinets painted to match & the marble countertop. this looks amaxing and exactly what I’m after however I’m in the UK, do you know if it is also available here? any of the curved edges are less likely to crack. We had “amore” first and it was very nice. I don’t know about Guarantees. It does look nice though. If I were doing it again I might even look into the thicker counter tops, I like how they look. Good Luck! Happy to help! Don’t let my daydreaming confuse you…I don;t even know if they make a thick formica, I have just like the thicker kitchen counters I have seen of late! good luck! What color subway tile did you use? Just the plain stock white Olean at Lowes. Thank you so much for posting this! I was dead set on Corian and now that I have done some research and looked and touched the formica I’m in love and sold! My husband was even more so when he saw the pricing!!! hooray!!! i love mine and even after 3 years they still look great! You helped me decide… Its going to be formica marble for my 18 year old counter tops! I hope it can be installed over the current countertops. Its such a waste to fill landfills with junk if it can just stay in place! I am putting calcutta formica in my new home. Having trouble finding a good white color for subway tile and white paint for cabinets. Any suggestions? your kitchen looks great! its basically everything i want to do to mine ! did you install the formica countertops yourself? we have the etching and it does not bother me. Good to know! It might just be I didn’t like it when the sample was 4 inches from my face, something I doubt I would do with my actual countertop 😉 Thank you for your very helpful posts!!!! Hi there, from what I can gather if I get the ideal edges then I will have a 45 degree seam in the corner. Do you have this seam then? Does it bother you? Would you mind sending a pic of the corner seam? How well does it line up? I LOVE Formica 180x line! I really want the Formica Calcutta Marble in my lake vacation home. I wanted white cabinets too……. My husband has his heart set on hickory cabinets! Should I still use the Formica Calcutta Marble I want? I feel I need to go with his hickory cabinets…..he would like whatever I choose…. He always really does…. However since he rarely voices his preferences in home interior items ….so him to say anything about cabinet type is something I really want to do…it’s his lake house too. I honestly don’t know the answer to that question. I would have to see them together, or at least see photos of the cabinets. Sorry I can be of more help. Hi there. Looks great. Where is your sink from? Hello, I am wondering how you are liking the countertops to date. are they holding up well? Any stains? I am wanting to get these for a new house that I’m buying with basic laminate countertops. Hi, what is the brand and where did you purchase your sink? Love it! 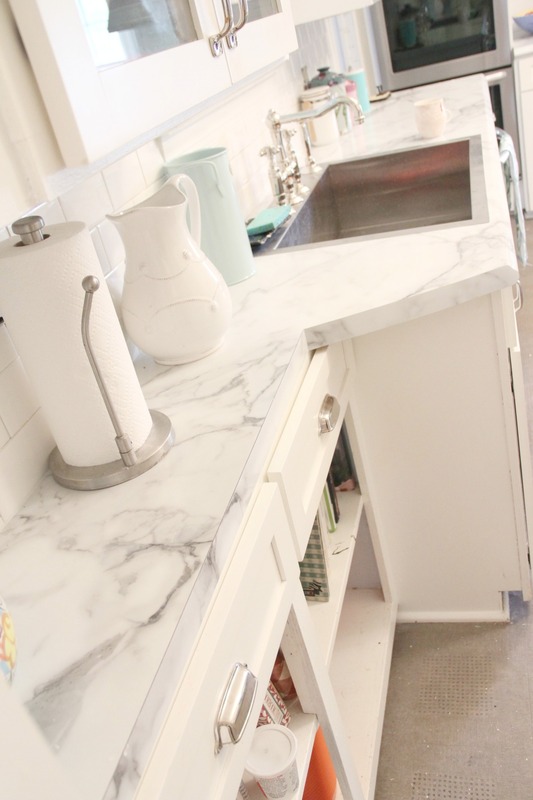 I am in the process of getting the Calacatta Formica counter tops done by lowes. They gave me choices for the edges but because I don’t want a big mitered seam in the middle of the L-shape, they are telling me that the standard square edge is my only choice. In your picture with the pink mixer clearly there is no diagonal seam. Can you tell me what edge is in that picture? There is no edge seam. The lower person is wrong. This drives me crazy. there are a number of edge profiles available. Do you have a home depot near you? Please let me know what the pattern is on the Aegean edge formica. I need to match this pattern and cannot find it. Hello Lesli! I’m just now getting “on board” with the 180fx by FORMICA Calacutta Marble option in style# 3460-90 which is the GLOSS finish. I’ve yet to see the ETCHINGS finish but I believe your kitchen is in the ETCHINGS? It’s July 2018 so I’m curious as to whether you’d still opt for “Etchings” finish or would you suggest “Glossy”? Redoing a VERY SMALL apartment unit so wondering if it’s better to go with LAMINATE “Wilsonart” Calacutta Marble vs FORMICA 180fx Calacutta Marble. I’m under the impression the only “difference” is with the “repeat” of the marble design? Which would be better on a small counter top? Thank you!